Saippuakivikauppias, for the very few unaware readers, is the Finnish word for a travelling salesman purveying soapstone and depicted here in the form of a small wooden man. The Long Lost River Song traces the mythological history of the Wellesbourne River that once ran beneath the building where Bom-Banes restaurant now stands and emptied out where the Old Steine is now. For the past – I think – four Brighton Fringe Festivals, local treasure Jane Bom-Bane, has penned musicals bespoke for her little self titled restaurant venue. These brief works of ultra home-spun genius are labour intensive, detail-heavy works that are born in, live briefly and die in her magical restaurant playground. If you catch one you are blessed indeed; they sell out in a jiffy. After a very lo-fi and infectiously charming ‘health and safety’ chat from waitress Daisy Jordan, our little group of five in total (maximum audience capacity) are ushered up the tiniest of stair cases to the very top floor of Bom-Bane’s legendary restaurant. Our first ‘course’ of song based storytelling is delivered whilst we are curled up on a double bed together, being careful not to bump our heads. It is, from the outset, magical. 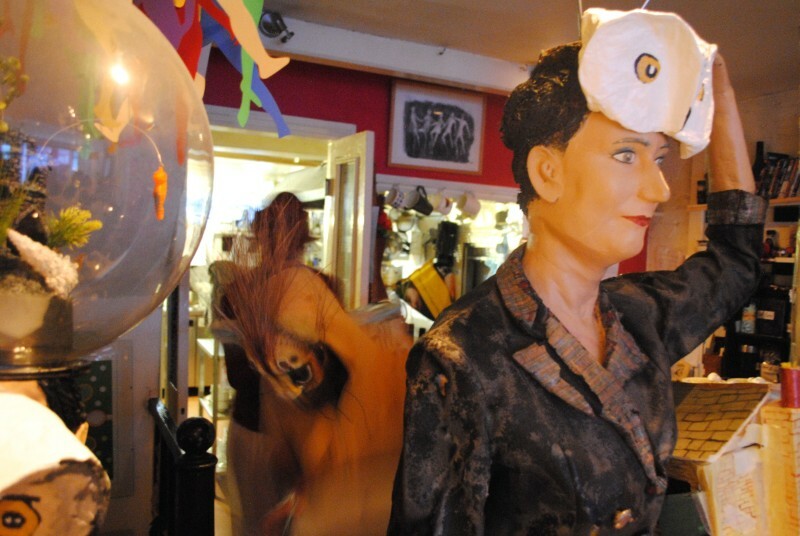 For those of you new to the Bom-Banes experience, home made food served in a kooky, quirky fashion, with live music, puppetry or performance so close you can touch it, is her stock in trade. It is all offered with such lashings of love and at a such compassionate prices, I challenge even the most misanthropic amongst you to not be utterly delighted. Pop in on any given night and you are more than likely to experience Jane singing her folk inspired, off-kilter melodies accompanied by harmonium and featuring her extraordinary collection of animated hats. The precious intimacy of Bom-Banes is what makes it feel like home to performers who ordinarily play much larger houses. Stewart Lee sometimes plays here to a ‘rammed house’ of 30. The musicals take over Jane’s whole life quite literally: We are invited into her bedroom for one act and her bathroom for another. We trace the river through rooms in the house, all the way down to the restaurant level, gathering cast members as the river itself gathers momentum. Finally we land in the restaurant area where we are fed a three course meal of simple, delicious fare sourced locally. Herbs researched for the musical (and mentioned in the songs) have been chosen for our supper with the help of Dr.Craig Jordan Baker, local foraging advisor. At seven cast members and five audience members, the geography (and the maths of it at only £20 per ticket) is perilous and mind-boggling, but the delight is utter. For this venture, Jane has assembled a high calibre family of songstrels – Eliza Skelton, Foz Foster, Colin Uttley, Freya Bowyes, Martin Peters, Lynn Thomas and of course Jane herself. There is also a back up choral ‘staff’ of Sarah Angliss and the lovely Daisy Jordan (health and safety officer) – all accomplished artists in their own right and delighted to be a part of this carefree negative economy. Jane’s dextrous lyricism coupled with incredibly delicate and unexpected harmonies makes this an auditory delight in itself. Add to this the delicious food and mad, love fueled creativity of the venture and it is already not to be missed. However for me, it is the precious intimacy of the experience that makes my heart leap for joy. It is the extra special – never to be repeated – shared moment between living breathing human beings that is the most golden, rare and priceless thing. This is what Bom-Banes does best. Long live Bom-Bane’s magical restaurant! Watery themes predominate in this wonderfully quirky set from Jane Bom-Bane. Accompanied by a harmonium and a ukulele, she sails through endearing stories of swimming-pool mermaids and brooding Brighton fishermen with wit and immense charm. Jane’s warmth, together with her peaceful attitude, create a relaxed and intimate atmosphere from the start, and it is with ease that she draws the audience into her performance once they begin to get a feel for the music. Tributes to Albert Einstein and Edinburgh Castle Rock in particular are creative and full of surprises. Refreshing, playful and brimming with energy, this is a truly original mixed media performance that combines music, poetry, artwork, and some very nifty hat tricks. “Bizzare, surreal, eccentric and fun. Prepare for a rollercoaster ride of sing along harmonies and hats. Jane Bom-Bane dazzles and surprises with her amusing lyrics and costumes, and … I must once again mention the hats! “Jane Bom-Bane is either a genius or an example of care in the community gone wrong.